A few posts back, I chronicled an acrimonious target match of 1804 between two Gloucestershire volunteer rifle companies. Here, from 1811, is another instance of sharp shooting becoming sharp practice, this time pitting the metrosexual beaux of the Duke of Cumberland’s Sharpshooters and the Yagers of the prestigious Honourable Artillery Company against the stoutly rural Nottinghamshire Riflemen, a volunteer rifle club founded in 1810, and the issuers of an “all England challenge”. 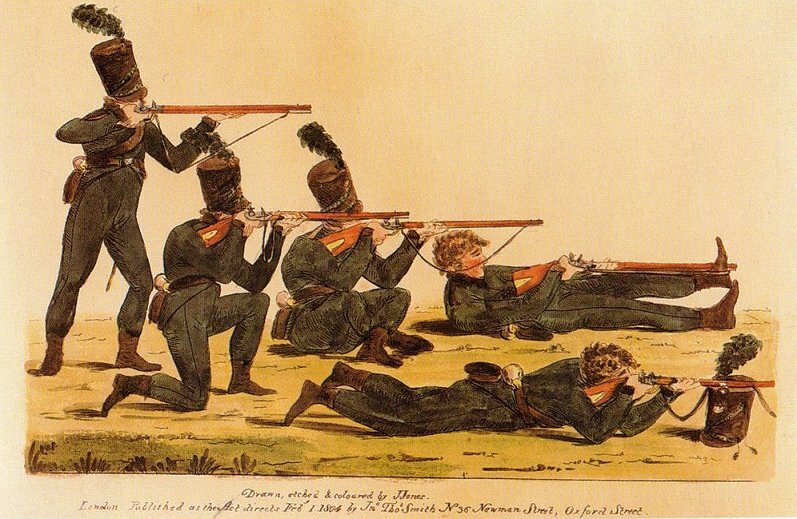 “The Riflemen of Nottinghamshire having challenged all England to fire at a target, the same was accepted by the Yagers of the Honourable Artillery Company, and the Duke of Cumberland’s Sharp Shooters, for a stake of fifty guineas a side. 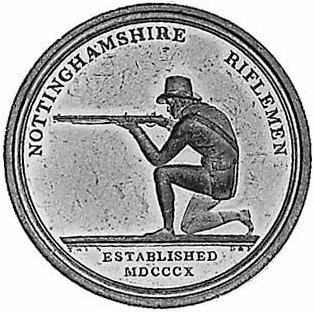 The stipulations on the part of the Nottinghamshire Riflemen were – to fire from the shoulder, at the distance of two hundred yards. Majority for the Yagers, 2. Majority for the Sharp Shooters, 13. The members of the Duke of Cumberland’s Sharp Shooters who fired, were Messrs. Henderson, Bell, Charlton, Lynch, and Fenton. The post-match booze-up in Stamford seems to have reflected this falling out. 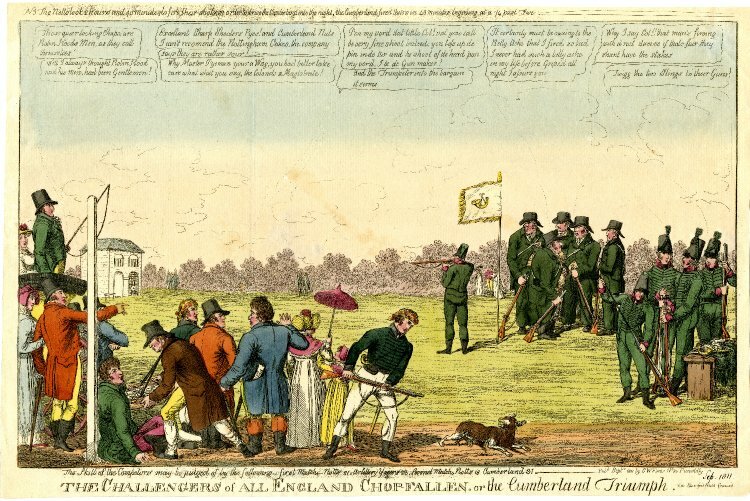 The Sharpshooters kept their own company at the Crown Inn, where they “spent the day with conviviality.” Down the road at The George, the Yagers and the Nottinghamshires shared a “sumptuous entertainment” of their own, culminating in the presentation of a silver medal by the former to the latter. I’ve not been able to discover the nature of the “rest from the body” used by the Cumberlands, nor in what sense the Nottinghams’ guns may have had “two slings”. Can anyone advise? The sharpshooting Adjutant Berenger of the Cumberlands was, of course, the fantasist and indefatigable self-publicist Charles Random, or “Charles Random de Berenger, Baron de Beaufain”, imprisoned for his part in the notorious Stock Exchange fraud of 1814. That same year the Sharpshooters morphed into a rifle club, resurfacing with the rifle volunteer movement of 1859 as the Victoria Rifles. Despite the Nottinghams’ “Robin Hood” tag, I’ve found nothing to suggest that the Robin Hood Rifles of 1859 traced their lineage to them. By the way, I do feel that “chopfallen” (crestfallen, dejected) is an old English term well worthy of revival. Whether a “competent person” ever finally settled the dispute does not seem to be recorded. There were, likewise, two rifle corps. One of these, the Severn Rifle Corps, consisting of three companies, numbering 180 men, was under the command of Major Samuel Wathen, of Newhouse, in this parish; and the other, called the King Stanley Riflemen, was commanded by Captain Nathaniel Peach Wathen, of Stanley House, in this county. 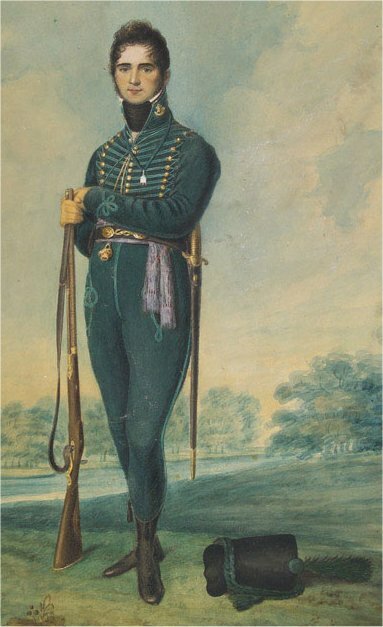 The uniform of the former was a bottle-green jacket and pantaloons, with black velvet cuffs and collar, a black velvet stock, a helmeted cap with upright blue feather, black leather cross belts and pouch, with horn powder-flask, a short rifle, and sword; and the uniform, &c, of the latter corps very much resembled it. On the 19th of April, 1804, there was a shooting match on Broad-barrow Green between these two corps, which led to unpleasant consequences. It had been agreed that ten men of each corps should fire 30 shots at 150 yards, and 30 at 200 yards distance, and that the unsuccessful one should give the winners a dinner at the King’s Arms Inn (now the George Hotel) in Stroud. At the trial of skill, the Stanley riflemen, (all of whom, except one, fired standing) put into the target 11 shots at 150, and two at 200 yards ; and the Severn riflemen, (who lay down and fired, resting their rifles on their caps) put in 16 shots at 150, and 7 at 200 yards ; the latter being, of course, the victors. Modern riflemen may well smile at the target practice of that day. The twenty sharp-shooters, and a few others of each corps, with their respective officers, dined at the King’s Arms, at the expense of the officers of the Stanley riflemen; the dinner passing off with great hilarity and satisfaction to all present. A somewhat incorrect report of the day’s proceedings, and especially of one of the toasts given after dinner, was written by James Burden, a private in the Severn rifle corps, and appeared in the next Gloucester Herald. This report gave such offence to the Stanley riflemen that, after several unsuccessful attempts to prevail on Burden to publish an apology for the obnoxious report, he was challenged to fight a duel with Joseph Cam, a private of that corps. Upon this, Burden moved the Court of King’s Bench for a rule to show cause why a criminal information should not be filed against Captain N P Wathen, Joseph Cam, and Lieutenant Henry Perry, for a conspiracy to provoke him to fight a duel, in breach of the peace, &c.
A rule was granted, and on June the 16th, 1804, it was argued by Garrow and Wigley, on the part of the defendants, and by Erskine on the part of the prosecutor, – before Ellenborough, C J, and Le Blanc and Lawrence, J J – and was made absolute. A criminal prosecution was accordingly filed against Wathen, Cam and Perry, which was set down for hearing at the Spring Assizes for Gloucestershire, in 1805. A verdict of acquittal was entered by consent, the matter having been left to the arbitration of Milles and Dauncey, two leading barristers of the Oxford Circuit, – these gentlemen made their award during the same assizes; in which they certified their opinion – “That the publication in the Gloucester Herald was not intended to convey any imputation or reflection upon the whole or upon any member of the King Stanley riflemen, and that the consequences which followed such publication arose entirely from misapprehension”; concluding with – “We are therefore of opinion, under such circumstances, that further explanation is unnecessary.” Thus a foolish affair was terminated; though at the cost to the defendants of nearly five hundred pounds.